A special watch to collectors and appreciators alike, the Patek Philippe 3940 automatic wind wrist watch is a marvel of clockmaking. 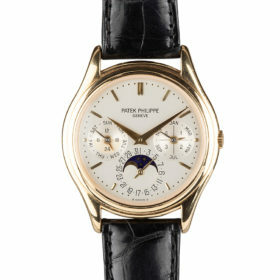 This timepiece boasts one of horology’s grand complications, a perpetual calendar mechanism. 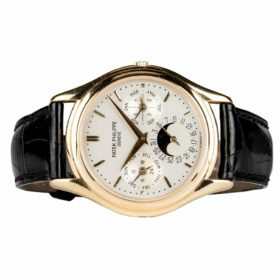 This watch holds the memory of 4 entire years, accounting for every month, day, and leap year. 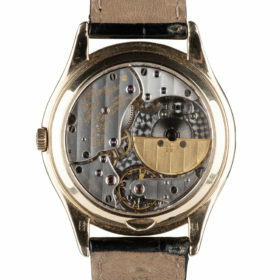 The watch features sapphire crystals, and houses a a 27 jewel movement, powered by a 22K gold winding rotor. 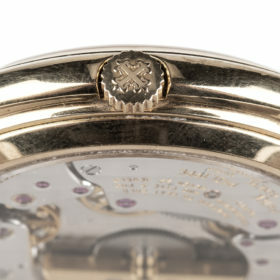 The case is crafted of 18K yellow gold with an exhibition back. A wonderful addition to any collection.